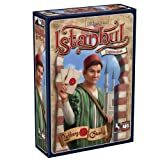 Istanbul is a German-style merchant board game. 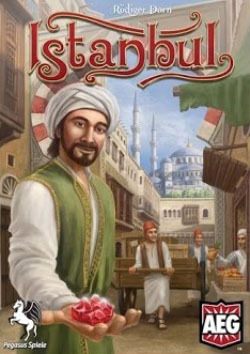 In this game, you are leading a merchant and his 4 assistants through the bazaar of Istanbul. At each location, you can order your assistants to do specific actions. The merchant will leave his assistants behind. To use them again later, your merchant has to come back to that place and pick him up. There is very little luck involved to win Istanbul and good organization is the key. As a player, you have to plan carefully where your merchant go and where he will leave his assistants. Without assistants, the merchant is unable to do anything. The core of the game is resource acquisition. There are four good types in the game. Players move around a 4×4 board and can change each game. This can be done randomly, but the rules do suggest specific layouts for beginner and advanced games. 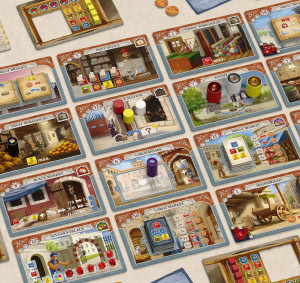 The tiles that make up the board allow players to do a variety of things. At warehouses players can load as much goods as they can carry. At markets, the players can sell goods for money. Mosques reward players with upgrade tiles for having a certain number of goods, etc. The Caravansery lets you draw a bonus card from the deck or the discard pile. At the Wainwright, you can increase your capacity. Two places are very important: the Sultan's Palace and the Gem Market because here you can acquire the gems (rubies). Every gem requires more goods than the gem before. The first player who can get 5 rubies will win the game. 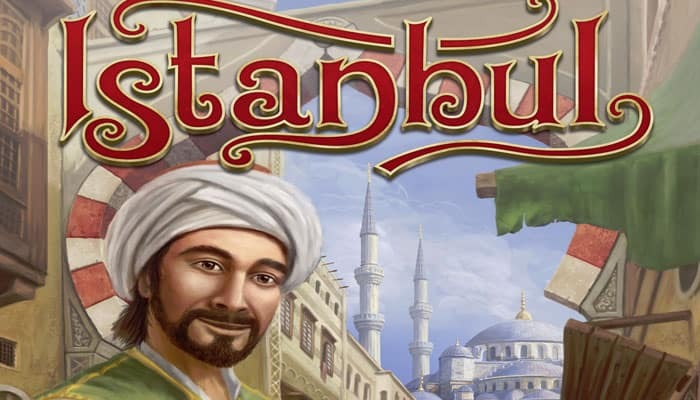 Instanbul is a very simple game. It's very easy to learn and the game play is quick. A full game is played under an hour. The game is best played by 4 or 5 players. Then the board feels full and there are fights for stalls all the time. With 2 or 3 players, the board does feel a little barren. Istanbul also has an advanced variant for one to four players where the fifth color is used as a "neutral" assistant. Each player starts with one neutral, and players can pick up any neutrals. This makes the game more interactive and tactical. The game is highly replayable for two reasons. First because of the variable board setup and second because the game is really fun to play. Instanbul feels sometimes like a puzzle that you need to solve, and a very good puzzle. The game is created by Rüdiger Dorn and illustrated by Andreas Resch and Hans-Georg Schneider. It came out in 2014 and is published by Pegasus Spiele. That year, it won also the Kennerspiel des Jahres award.